There are so many sites out there to book flights! While they all have their pros and cons, we tend to migrate to a select few when we begin searching for flights. Part of booking travel reservations is knowing when to actually commit to buying the tickets. It is important to know the general trends of the ticket prices, but be ready to pull the trigger if there’s a good deal! We always like to search a couple different sites to compare the flights on each one. 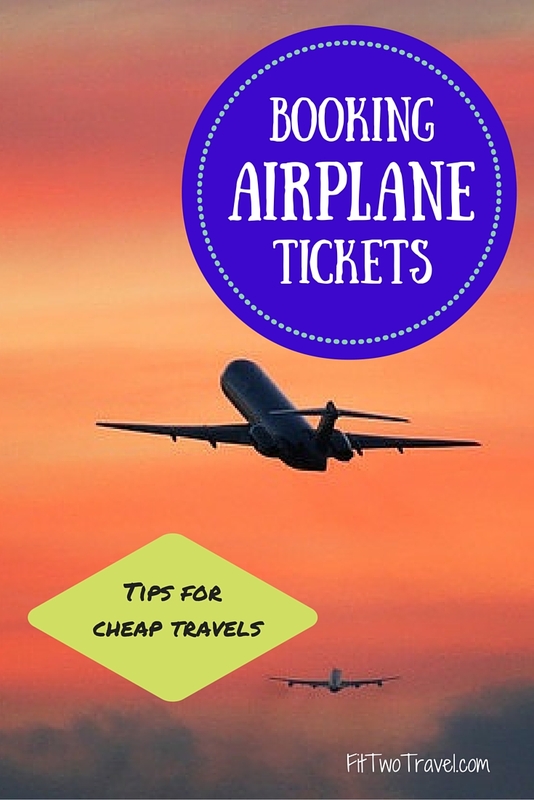 Here are our top 5 sites for booking cheap flights. If you have flexibility in your dates and destinations, skyscanner is a great choice. Skyscanner searches all airlines, including “budget carries” such as Jet Blue or Air Asia. It allows you to search by a specific date, week, month or even see the best prices throughout the whole year. 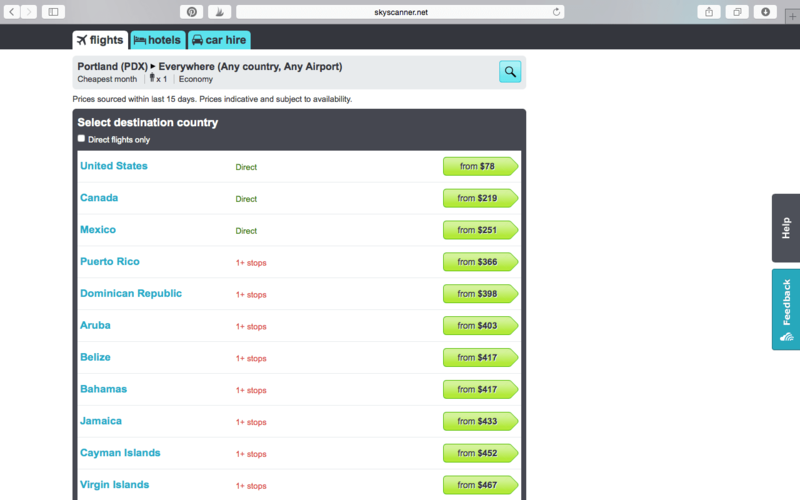 You can also search “everywhere” in the destination box and from there you can see the cheapest spots from your origin. Once you find the flight you want, it takes you to the airline. We have found some of the best flights on skyscanner. If you’ve never used Skyscanner, download the app to find the cheapest flights everywhere. There are lots of other sites like skyscanner but we use skyscanner the most. Kayak is probably the simplest site listed. 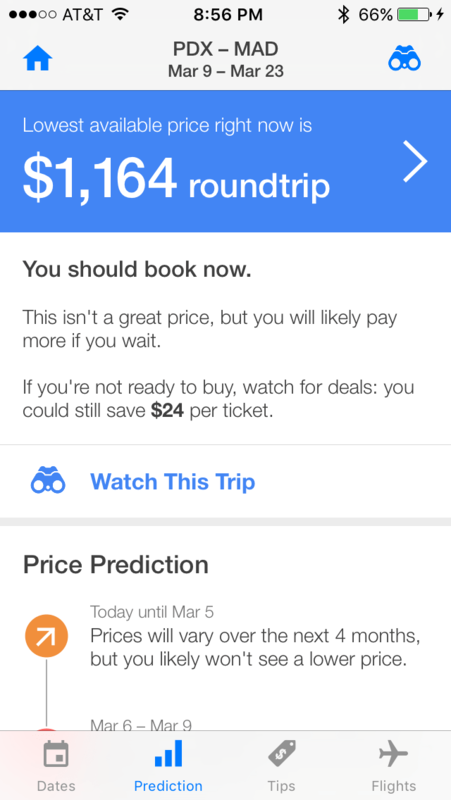 Kayak allows you to filter by airlines, duration, or price. If there is enough data on the selected flight, the price predictor will forecast if prices will go down or not. You can also search for dates 3 days before or after your ideal dates, or search nearby airports if your trip allows some flexibility. 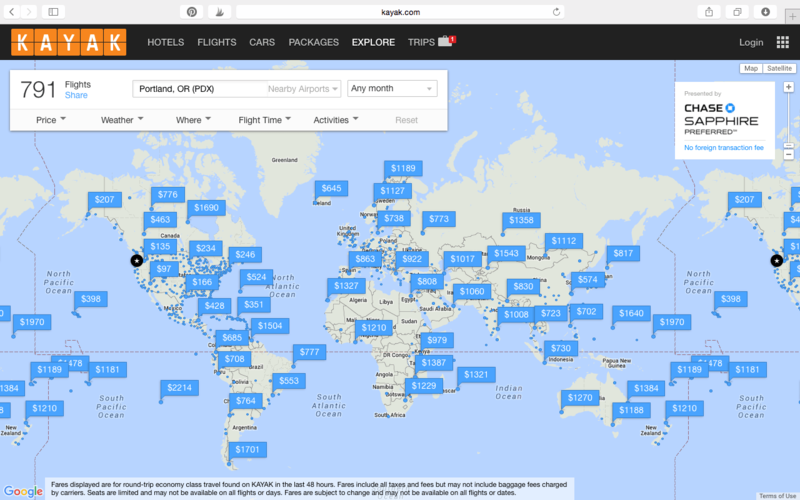 Kayak has recently added an “explore” option, where you can enter your destination and see a map of the prices to certain locations. The “explore” option even lets you narrow down search options by specific weather or things to do! 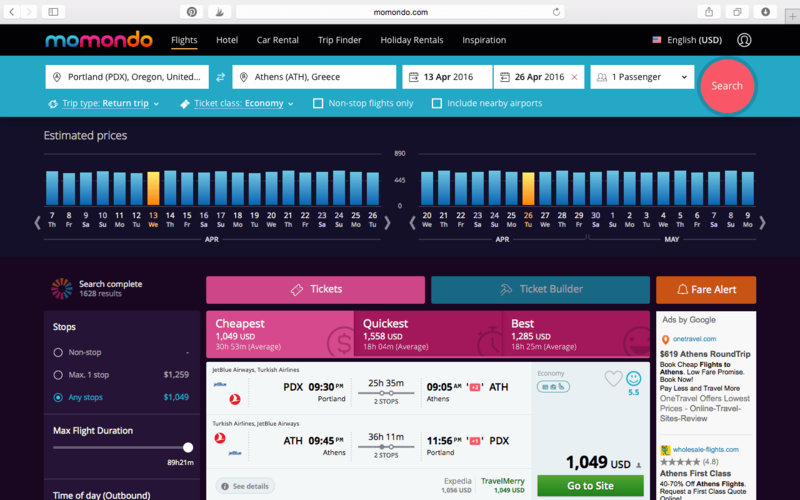 Momondo picks from airfare sites to find the lowest fare each way. It has a nice little graph at the top that shows the cheapest flights to that destination. You can filter the flights by the quickest, cheapest, or “best” flights for your desired flight choice. Momondo ranks the flights and shows smiley (or sad) faces based on the flight time and the price. Momondo also shows a nice little calendar at the top to allow you to compare prices on similar days. Hipmunk is one of the newer searches we have been using. It allows you to search for flights by “agony” to optimize your flight by price, length, or layovers. We personally like to see the differences in flight times, as we don’t want to waste too much time on layovers if we can help it. The layout of this site allows you to easily compare the flight and layover times, including what time you will depart or arrive at the destination. Hipmunk has recently added flight deal alerts, allowing you to receive updates through email. Hopper, which is only available on your phone, is a newer site that we’ve recently discovered. 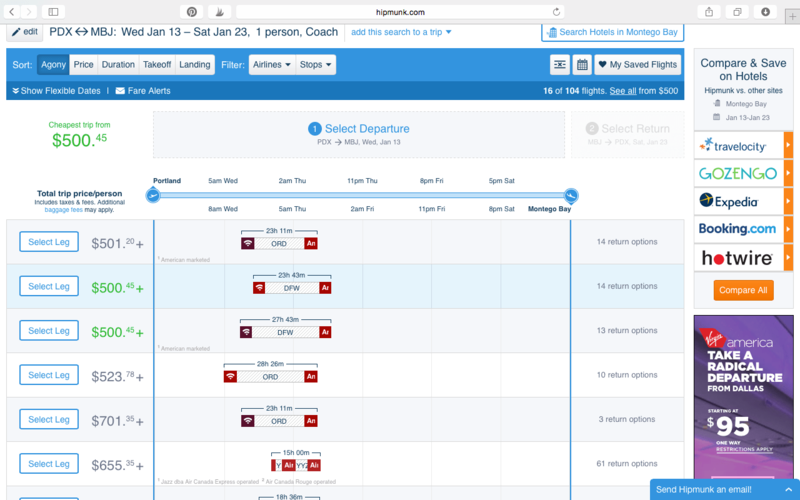 Based on where you want to go, Hopper will show you a calendar with round trip prices on different dates. You choose the flight you want and if you aren’t ready to buy yet, you can watch the price. The app shows the cheapest months, what day is best to buy, which airlines have cheapest fares, and searches the closest airports. Hopper advises you if you should buy now or wait, and seems to predict how much prices are supposed to change (although we haven’t followed through to see if the predictions are correct). You can set up alerts to notify you when prices have changed. We have not actually booked through site, buy it has been fun to watch the flight prices. You can book directly through the app, although hopper does charge a small commission for the booking. None of these are 100% perfect so make sure you check with a couple of them to see what brings up the best prices for your trip. Don’t forget to search around a little before you push the purchase button! And once you do buy, don’t look back! Enjoy and now it is time to start planning the next one! What is your favorite website for booking plane tickets? Are there any you think we need to add to our list? Thanks for sharing! I’ve always used skyscanner til now. Thank you for this overview! We are just about to plan our trip to the US, so it is super helpful. So far, we have been only using skyscanner. Glad you like it! We really like sky scanner too, but check those others to compare the prices. Where in the US are you going? I just started using Hipmunk and love it. The app is more user friendly for me than on my desktop. It shows months at a time with prices for each date like Hooper. One feature i would really like to see are generic alerts. right now you need to add specific dates in order to configure an alert.